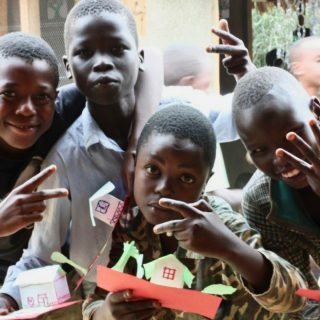 This story by Alyssa Cogan is from Mercy Corps, a leading global organization powered by the belief that a better world is possible. (Learn more here.) Photos by Corinna Robbins. Ziad owned a restaurant and a market in Syria, but was forced to leave it behind when the war started and he was kidnapped, tortured, and ransomed back to his family. He and his family left for Lebanon, where they struggle with hunger, poverty and discrimination. The heat is stifling between the plastic walls of the room where Ziad stands. A rotating fan provides little relief from the hot, dry air. A half circle of children is seated before him, each waiting cross-legged on the thin rugs that cover the concrete floor, with a blue notebook and a pencil placed neatly on their lap. One plant, the fan, a couple of teddy bears and a whiteboard procured especially for these lessons decorate the small, modest room. Paying no mind to the warmth, when Ziad asks a question, a cluster of small, eager hands shoot into the air. Class is in session today — and the children are hungry to participate. There is just one thing: Ziad isn’t a teacher. This isn’t even a school. This class is taking place in the main room of Ziad’s tent in an informal settlement in eastern Lebanon, where a couple hundred Syrian refugee families are trying to eek out a living in a setting ripe with hunger, poverty, and discrimination. As refugees, Ziad’s kids don’t have access to formal schooling. And, of all the challenges Ziad’s family is facing, this is the one he is most dogged to overcome. In Lebanon, only around half of primary school-age the Syrian refugee children are enrolled in school. Over a million Syrians have flooded Lebanon since the start of the crisis in Syria, taking shelter in cities, neglected buildings, and informal settlements, wherever they can find cover of some sort to protect them. The settlement where Ziad lives lies at the end of a long, dusty, dirt road in eastern Lebanon’s Bekaa Valley, the country’s agricultural epicenter. Here, surrounded by farmland, hundreds of Syrian refugees fleeing war have occupied a compound of small, abandoned cinder block buildings. A tangle of makeshift tents like Ziad’s — concrete pads with tarps and blankets for walls — fill the spaces in between, housing the overflow of families seeking refuge. 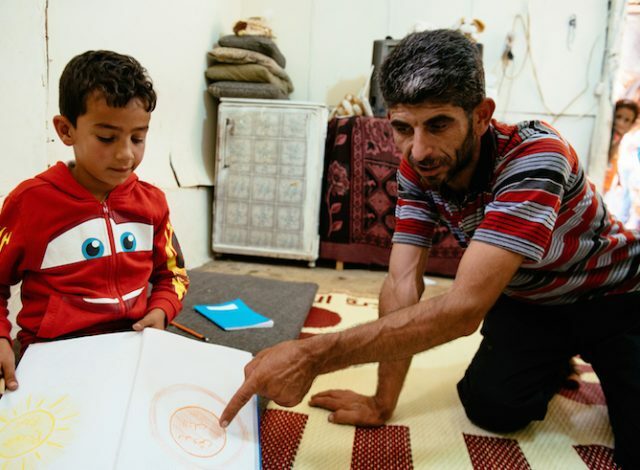 Ziad is determined to ensure Syrian children in his camp continue to receive an education. He created a school out of his tent and leads lessons on reading, writing, and math. 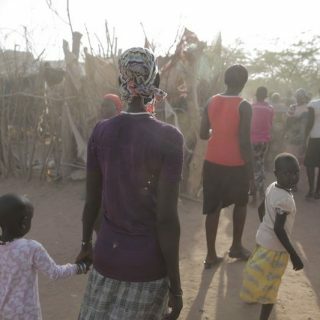 Mercy Corps provides water and sanitation support, and is helping make rudimentary shelters safer and more livable. But, still, life here is difficult: hunger, unemployment and stress are constants for nearly everyone. Only around half of primary school-age Syrian children in Lebanon are enrolled in formal education. And, in the Bekaa Valley, attendance is even lower: 36 percent. Despite the government’s efforts to include Syrian children in the public education system, obstacles like transportation fees, safety concerns, language barriers and discrimination keep many children from enrolling. 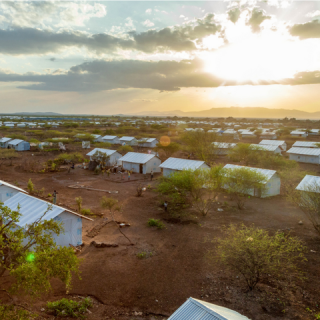 Living in poverty, and without access to school or other safe spaces to grow and develop, countless young refugees are fated to sit idle in their shelters or work to support their families. Too often, there simply isn’t anything else for them to do. But as his settlement’s “shaweesh,” (its informal leader,) Ziad feels a great responsibility to care for the men, women, and children living here. It’s the Syrian way, he says. And so, when the public school his bright and curious son Simon was attending in Lebanon ran out of space for him last year, Ziad didn’t waver. He decided to teach lessons himself. And not just for his son, but for all the children in his settlement who were missing out on their education. In an environment without structure and opportunity, the school sessions Ziad hosts in his tent provide a small amount of hope and security. Only 50 percent of refugee children are enrolled in primary education, while 25 percent are estimated to be in secondary school. And a dismal 1 percent have access to education beyond that. 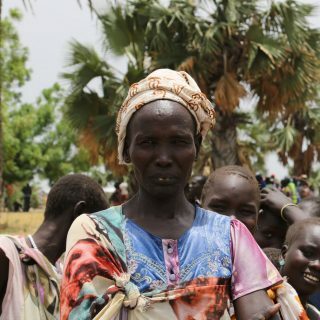 But, according to the United Nations High Commissioner for Refugees (UNHCR), education during displacement is vital. It can promote social cohesion, support emotional healing, offer safety and prepare young people to rebuild their communities and pursue productive lives. It can also foster peace: Across society, every year of schooling decreases the chance of a young person engaging in violent conflict by 20 percent, according to the World Bank. Ziad sees first-hand what is at stake and is desperate to instill in his children a different destiny. Since starting his school, Ziad can’t walk through the slapdash streets of the settlement without collecting a pack of kids, blue notebooks in hand and ready to learn, on his way. Children in the settlement, armed with blue notebooks, follow Ziad, hungry to learn. He has somehow managed to secure markers, pens and other basic supplies, and hosts class twice a week from the main room of his tent. Traditional lessons range from Arabic and arithmetic, to the seasons, the nutritional value of oranges and the difference between a river and the sea. “I don’t really have a curriculum, but I try my best to keep them learning, to keep teaching them something, so they are always learning something,” Ziad says. For his students, he has become an anchor in an otherwise volatile existence, and the close attention he gives to them is just as valuable as the academic lessons he offers. By encouraging the children to draw, Ziad is able to find out what they’re thinking about and how they’re feeling, making it a point to engage those who are reliving traumatic memories. If today is a bad day, he tells the kids, tomorrow will be better. Some days you will be happy, like when you go to a wedding, and some days you will be sad, like when you go to a funeral. You just have to trust that you will be OK in the end. Mercy Corps strives to ensure young refugees don’t lose their futures to conflict. We build temporary learning spaces and distribute school supplies for kids who have been displaced from their schools and communities. We work to ensure the most vulnerable children, like those with disabilities, have transportation and resources to continue their education. You can help: Sign Mercy Corps’ petition urging Congress to support humanitarian assistance that helps refugee children and their families—and add your name to the #EducationForRefugees petition, too.